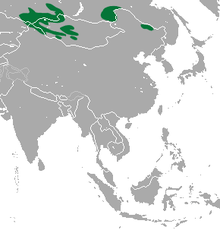 The alpine pika (Ochotona alpina) is a species of mammal in the pika family, Ochotonidae. It is found in Kazakhstan, Mongolia, and Russia in very cold, mountainous regions. It is a small mammal only weighing about 5 ounces (0.31 lb) and about 7 inches (18 cm) long. They have no visible tail, round ears, and sharp claws used for foraging and digging. They feed mainly on plant stems, which they gather during the summer for the winter months to create haypiles. This storage will sometimes be shared with other species such as reindeer. They have been known to share their burrows with snow finches, as they will help them build their nest. They are sometimes referred to as the whistling hare because of their rabbit-like behavior and high-pitched warning calls. 1 2 Smith, A.T. & Johnston, C.H. (2008). "Ochotona alpina". IUCN Red List of Threatened Species. Version 2008. International Union for Conservation of Nature. Retrieved 10 November 2008. Database entry includes a brief justification of why this species is of least concern. ↑ "Alpine pika pictures and facts". Retrieved 26 December 2013. ↑ "Animal Facts alpine pika". Retrieved 26 December 2013. ↑ "Pika". NWF. Retrieved 26 December 2013. Wikimedia Commons has media related to Ochotona alpina.